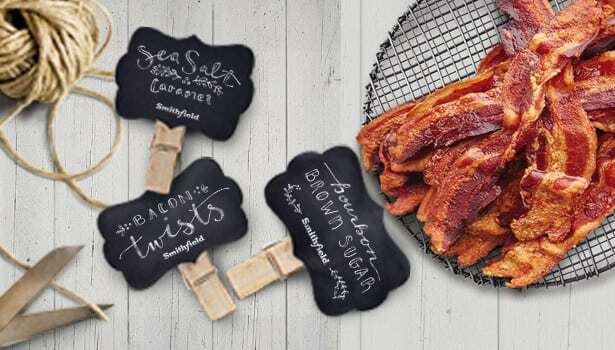 Home » Articles » English Articles » Create a Smithfield “Bacon Bar” for the Holidays! 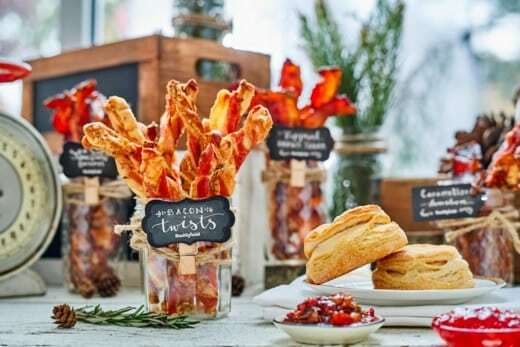 Create a Smithfield “Bacon Bar” for the Holidays! A huge thank you to Smithfield for sponsoring this post and giving me the opportunity to share about this awesome idea for the holidays! Keep reading to find out more and to enter for a chance to win bacon for a year coupon booklet from Smithfield estimated at a $416 value. I don’t know about all of you, but in my opinion, bacon is just about one of the best ingredients around! It is true what they say – bacon really does make everything taste better. 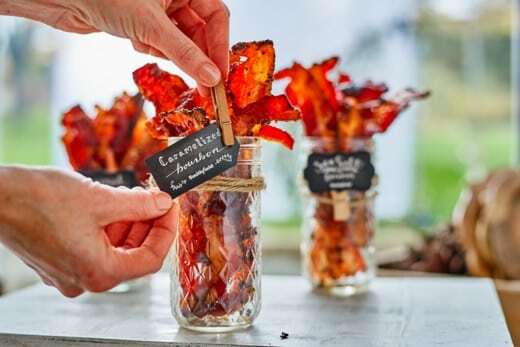 Many of you may have heard of a nacho bar, a taco bar, a slider bar, and even a hot chocolate bar – but have you ever heard of a “Bacon Bar?” My guess is that you haven’t, but now that I mentioned it it sounds great, right?! I honestly had never even considered doing something like a bacon bar until I was introduced to the Smithfield Bacon Bar website, which you can visit here. So what does a Smithfield Bacon Bar consist of? Well, of course it is going to have bacon, but we aren’t just talking regular strips of bacon on a plate. There are so many different recipes that you can make with bacon and that you could use when creating your bacon bar. Click here for some amazing options such as Crispy Bacon Twists with Gouda and Apricot Preserves, Cherry Bacon Jam with Thyme and Cloves, Bacon Cheddar Biscuits, and more! The holiday season is the perfect time to try out a Smithfield Bacon Bar. If your family is like ours, you probably will be getting together with family often in the next month or so, and that means that you may be planning some family breakfasts. What better way to bring the family together than with some delicious bacon recipes for breakfast? If you are hosting the bacon bar at your house, you can even download some great printable tags from the Smithfield website. I know that I am planning on creating a bacon bar using Smithfield Bacon this holiday season – I even picked some up this morning and started working on perfecting the cook so that I can make a great bacon bar in a few weeks. What would you include in your bacon bar? I would love hear about it in the comments below. Also, check out this giveaway for a chance to win a “Bacon for a Year” coupon booklet from Smithfield. It has an estimated value of $416.00 and would definitely help you with your bacon bar! The bacon twists look yummy! I LOVE the sound of Bacon Jam and biscuits!!! I like the bacon twists and the sea salt caramel. My favorite is their recipe for bacon cheddar drop biscuits. That is kind of an all-in-one breakfast. I love, love, LOVE bacon jam!!! Oh man….BACON!!!! This recipe looks incredible! Totally trying that during the holiday! That caramelized bourbon brown sugar version is call my name– loud & clear!! The Caramelized Bourbon Bacon sounds amazing! Bacon jam all the way baby! Crispy Bacon Twists with Gouda and Apricot Preserves sounds amazing! I would want to try that first! This is so fun! Who wouldn’t love a bacon twist? We make cheddar biscuits at home all the time. My family might die if I added bacon into the biscuits. Then top with some bacon gravy?? Oh man. I think I just won the hearts of Mr family forever. The BACON WAFFLE BAKE is my favorite! I’m loving the idea of sea salt bacon! 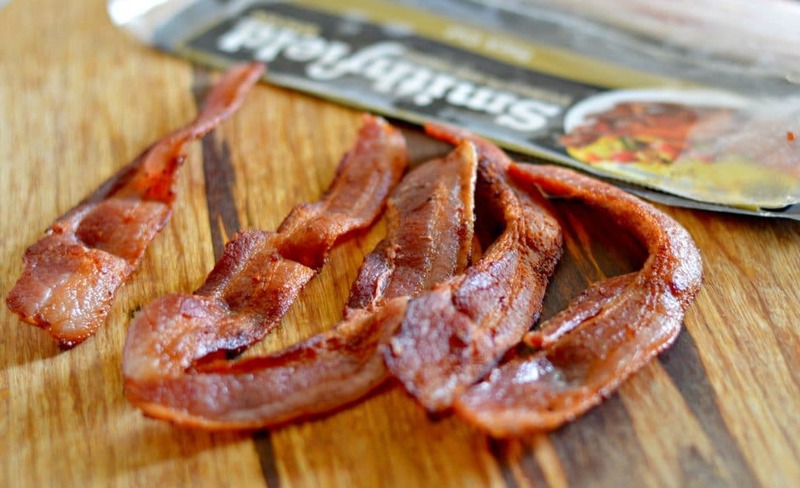 I love sweet and salty so the Sea Salt Caramel Bacon sounds awesome! Love those tags, they are too cute! Bacon Jam and biscuits sounds good to me.